Comments: I would hate to hear that the OKC fair is anything other than spectacular. Nothing against Tulsa's fair, because I think it's great, but you can pretty much see everything in a day. With the OKC fair, you could probably see everything in 2 days if you went there early in the morning and left late at night. I haven't been in probably 7 years, but I too have heard that there has been a decline in it recently. Too bad. Comments: The fair is coming! Probably the only time of year that, for me, all common sense regarding what I should or should not consume goes out the window. Can't wait for the fried Twinkies and fried cheese on a stick. I still miss going to the OKC State Fair. You're talking 7 large buildings full of display booths. There's the International Building (featuring an inflatable dome roof), the Kitchens of America Bulding (all of your cooking shows are here), and the Made In Oklahoma Building (self explanatory). If you attend the annual Texas-Oklahoma football game at the Cotton Bowl in Dallas, I believe your ticket includes admission to the Texas State Fair, as the Cotton Bowl is located in Fair Park. The Texas State Fair is always considered the largest fair. Sounds fun! Location: Deep within my darkest recesses of my library. Comments: I think it is interesting that the World Wide Church of God was far from mainstream up until about ten years ago when the church abandoned the teachings of the senior Armstrong. Since then, as I understand it, they have taken a more conventional theological stance. I just received a gift from a childhood friend of mine that I have not seen in over thirty years. It is the complete DVD set of Fireball XL5. Come on over and watch them with me. I'll have my special blend of popcorn and M&M's waiting. When I watched this show in the early 60s, I thought that launching ramp was a little hokey, since actual rockets of the time launched straight up, but it is actually feasible to do it that way. The same method was used in the sci-fi movie, "When Worlds Collide". "Fireball XL5" showed a lot of attention to scientific detail, which you might not have expected from a "Supermarionation" production. The Tulsa State Fair starts tomorrow and we have a new TSF page here. The expansive site in Pasadena, CA of the former church was sold recently, and at last report was to be developed into pricey homes and condos. Not sure what will happen to the highly-rated Ambassador Auditorium. Comments: Hi Mike, can you find the link that appeared on this website that featured many photographs of old Tulsa buildings and locations? I know I saw it here but I can't locate it now...thank you!! That's probably the Retro Tulsa Internet Museum from the Links page. The TTM Briefcase on Channel Changer 2 also has motel/restaurant pictures. Comments: Grew up in Bartlesville in the 50's & 60's (Sooner '71! ), got lots of fond memories of Tulsa TV/Radio. Anybody remember the short-lived rock format round-about 1970 on, I believe KRAV - "We Do Your Thing"? It was much more progressive than the Top 40 from KELI or KAKC, but didn't last, there just weren't that many FM radios among the target audience (teens-20's) back then. I still remember their sign-off "KRAV(? )- We DID Your Thing". Had a friend in Bartlesville, Jim Frey, who did sound for a lot of different people in the area, including some work for Mazeppa, AKA Gailard Sartain. Still have the 45 of the Mazeppa Show theme song that Jim got for me. Ah, the good old days! Comments: Garner Ted Armstrong ran on 8 and 6 for years - as long as he paid the bill that for the "time buy"..he was kinda like someone who made sense in his reasoning 50% of the time - the rest of the time he was talking to Martians. He had a Lear Jet that he supposedly flew himself and popped up in Tulsa numerous times. He was later dethroned by his father, Herbert W. Armstrong for doing too mucha that stuff that Jimmy Swaggert did in his sinful days. Later several groups including the Philadelphia Church of Edmond, OK (!) took on the mantle of delivering the late Herbert W's views. They were running 2 years ago on GoodLife TV cable. Comments: This October 1st, 2003, the Cain's Ballroom will re-open after the completion of a million dollar restoration and will celebrate 80 years of musical history. On November 1st, 2003, Leon Russell will be back in his hometown performing at the Cain's Ballroom. For more information, check out: www.cainsballroom.com. Comments: Interesting about spelling. In research--probably done forty years ago, now--Bell Labs guys found that whole words could be left out of telephonic messages and the meaning would still get through, and, further, that if only parts of words were transmitted, the same thing occurred. It was this discovery that aided much of the high speed messaging that we have today. Aoccdrnig to a rscheearch at Cmabrigde Uinervtisy, it deosn't mttaer in waht oredr the ltteers in a wrod are, the olny iprmoetnt tihng is taht the frist and lsat ltteer be at the rghit pclae. The rset can be a total mses and you can sitll raed it wouthit porbelm. It really is. Coney Islander still puts up completely scrambled famous quotations on a chalkboard for the amusement of customers. Even so, you can often sort it out pretty quickly. Alas, computers aren't yet as flexible as humans, so I'll continue to attempt letter-perfect coding behind the scenes of this site. More on the one piece at a time Caddy with pictures. Comments: Sasha Foo has found her way to Channel 51, KUSI, as a reporter. Hey, thanks for the update, Cathie. Here's what we have on this site about Sasha. Comments: Evidently the news came too late Monday for today's (Tuesday) Tulsa World, but radio/television evangelist Garner Ted Armstrong died Monday afternoon in a Tyler, Texas hospital. He was 73. Armstrong hit his stride in the 1960s and 1970s with "The World Tomorrow," which he did for his father's Worldwide Church of God (of Pasadena, California). However, he was forced out of that church in a power struggle in the mid-1970s. His father, Herbert W, Armstrong, declared Garner Ted to be "ex-communicated." Garner Ted lost no time in founding the Church of God International in Tyler, along with the Garner Ted Armstrong Evangelistic Association, in 1978. I had no personal contact with the man; perhaps our older broadcasting "vets" did. Comments: Never accept Confer's statements at face value. He says he's above ground, but I intend to check it out. Many people do care, and that is very good news! Comments: A Johnny Cash story from the late 70's during my KOTV years. I just wish my memory was better (for lots of reasons). Cash did a novelty song called "One Piece at a Time," the story of a Dee-troit auto worker (one of Cash's first jobs, before the Air Force and music) who decided that GM wouldn't miss it if he slipped a part of one of those fine Cadillacs out of the factory every day so as to build himself one at home. The joke was that it had a transmission from a '49, fins from '58, one headlight on the left, two on the right, and so forth, as a collection of parts from models over a 30 year career building Caddies. A junkyard owner up in Miami, OK, who I think was named Bill Patch, actually cobbled one together, and invited Cash to come pick it up. It was a late Friday night story, but I thought it might be fun, so we steered Northeast up the pike, a trusty photog (maybe Jim Duggan?) and I. Dang, I wisht I 'membered better. Anyhow, it was not much of a story, but Cash loved the car, and his smile lit up the junkyard, even as it approached midnight on a Friday night. I think he accepted the gift and it was on display for several years at the House of Cash near Nashville. By that time, John R. Cash had exorcised--or at least gotten a rein on--many of the demons that had driven him to the edge of destruction so many times in the 50s and 60s, and looked--at least on one Friday night in Miami, Oklahoma--like a man very comfortable in his own skin. Several years ago, I had a meeting with John Rollins, whose many businesses included the Orkin Pest Control empire, a huge truck leasing firm, and the Dover Downs racetrack, which was a big advertiser with my station. Rollins was in his mid-80s, but sharper than a tack. He was close to Johnny Cash, and had gotten him the plantation retreat in Jamaica that Cash spent many of his later years on. Rollins said that, of the many people he had met through his wealth and businesses, that John was a favorite because he treated everyone with respect and dignity from the bum in the street to the billionaire. Like Cash, Rollins had gone from poverty to great wealth, and like him, never forgot where he came from. Location: Top of press box shootin' wet football. Comments: Clayton...I ran the tite cam on each & every one of them! Doubt if any 1" reel type tape is still around. We aired them the next day I think, tho live was done from the fairgrounds often due to a "B" cable line which sent the signal from the truck back to Tulsa Tablevision's head end. Comments: Racing returns to the Fairgrounds!! I remember seeing Tulsa Cable TV cameras at the Fairgrounds Speedway, usually up high by the press box. (late 70's/early 80's) Were the local races ever broadcast on local cable, or could they have just been filming highlites? Would any tapes of this exist? Comments: Re Johnny Cash - friends saw him in small club setting here 5-6 years ago and said that was the only way to really appreciate his performances. I'll miss him...if you go to www.johnnycash.com - see an excellent photo history on this American icon whom we lost today. We were watching Peter Jennings' excellent homage to Johnny Cash on World News Tonight when we heard PJ say, "...Cash and his partners' 'boom-chicka-boom' sound started..." - 3 times. Bad edits at ABC in his narration track that made it to air. John Ritter is being seen too much today with "Three's Company" clips - but others of us remember him from "Hooperman", also the 2 year run of a show that he did with Markie Post set here in DC ("Hearts Afire" with Billy Bob Thornton) and I forgot about his role in "Clifford the Big Red Dog". He did a lot MORE than playing "Jack Tripper". Tonight I fed out an interview for Entertainment Tonight with Priscilla Barnes on John Ritter, she replaced Susanne Summers on "Three's Company". It was shot in DC. I was talking to the producer and she had no idea that Tex Ritter was related to John Ritter. TTM readers should see Lee Woodward's previous postings on the Ritters. Comments: A sad day indeed. My wife reminded me of the Tulsa World tribute the month we lost both John Lennon and our own Johnny Martin. Comments: Boy, they just keep coming. I just learned of the deaths of Johnny Cash and John Ritter. One was almost expected, the other was shocking. It's kind of ironic that these are two individuals who have seen success, then a down period, and were having success again. This has been quite a year for loss in the entertainment industry. Comments: Wow...got all the quiz right. Had to guess on a couple though. I just learned that in the new issue of Rue Morgue Magazine (focusing on horror in culture and entertainment), David's CD "Jethro Stull"was given a "5 skull" rating. Congrats, David. Location: A long way from the nearest Sonic, and decades from a Merry Christmas Value from OTASCO. One commercial I think not remarked on was the Oklahoma's Pride Meats that was a billboard sponsor on the Channel 6 10-O'clock news every Thursday Night. It started out "Whether you say Boloney or Bologna.." to which Ken Ragsdale would always interject "it's still lips and ears." Thursday night was always billboard night when I produced at 6...besides Oklahoma's Pride, there was Mid-America Savings, Coors, and somebody else--maybe Evans Furniture Revolution? Mike Grant, who did the voice at 6 in the mid-late 70's and later wound up as a GM in the Belo chain, had to get breathless to get all those billboards into 20 seconds. On a sadder note, the Sept. 11 anniversary passed up here. I won't repeat my story, since I recounted it a day or two after the fact, and it's available in the guestbook archives for those who care. Compared to some of our neighbors, it's both mild and tame. For a lot of folks, including yours truly, a whole lot of water has gone under the bridge in 730 days, but remembering those whose loss is permanent means our own situations get into perspective and, more important, that we haven't forgotten. Comments: I only got 9 out of the 12 questions on the quiz; I had trouble with #3, #8, & #11. Some were lucky guesses. Comments: I just took the (Java-required) commercial quiz, and scored 10 out of 12 correct. Not bad for a guy who didn't see most of those commercials. Growing up in OKC, I do remember the OTASCO commercials, but I managed to get one of those wrong. Here is a recent photo sent by Carl ("Uncle Zeb") Bartholomew (on the right). 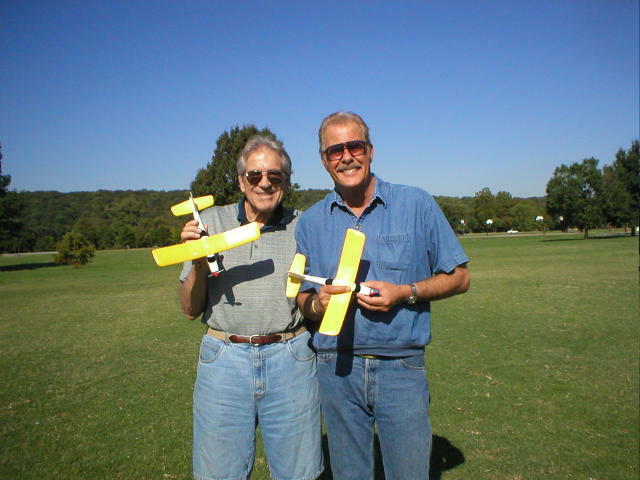 Bob Hower (left and below) sure likes to fly those yellow planes! 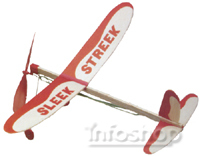 That looks like a lot of fun...makes me want to go buy a "Sleek Streek" balsa wood plane and wind that long rubber band into double knots. 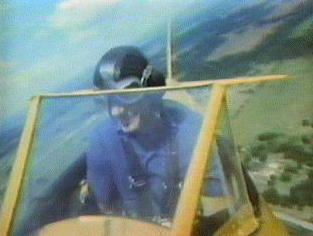 Bob in one of Carl's "8's The Place" spots in the 1970s. Comments: HAHA....Mike, that's pretty funny....dontja just love that slap-back? Comments: First of all, I concur with Jim Ruddle that Mack Creager was unbreakable. When I worked with him at KOTV, we tried numerous times, but always failed. But returning to on-air antics at KTUL Radio during its waning days: One memorable break-up attempt came while I was reading a serious story about a civil rights demonstration in the South. A voice attempting a heavy ethnic dialect, barked over the intercom: "You're doing a great job, man. I looked up and was astounded to see a figure in a white robe, complete with a cone on his head, waving a burning torch. Reporters with bad information occasionally are burned on a story. But the expression took on new meaning when, inspired by the clansmans burning torch gag, another fiery prank nearly backfired. While running the control room board, I decided to make the newscaster believe he was about to be consumed by fire. I placed some wadded AP copy into several ashtrays, scattered throughout the control room. The paper was then soaked in lighter fluid, and ignited. I turned out the lights and sounded like a siren over the intercom. The newscaster nearly jumped out of his skin. When he looked up, the prank victim thought he had become an eyewitness to what KAKC News would have described as a control room conflagration. Unfortunately, the prank worked a little too well. Flames leaped higher than anticipated lapping at the ceiling before the stunt was brought control. No doubt, if the Turley Fire Department had responded, we would have made embarrassing news. However in his crowning achievement, Parsons looped a single tape through two recorders. One machine recorded off-the-air and the other played back with a short delay before repeating the process. When Les began recording off-air and playing back, the results were startling. When I said, "Good evening, this is Mike Miller reporting," one second later the "Good evening was repeated on-the-air in two voices. Whats going on? I asked on-the-air. A second later it was four Mike Millers reporting and two voices saying, Whats going on? Soon it was a room full of my voice, repeating everything I said and multiplying at the same time. No doubt, it sounded strange to listeners. But by that time, bizarre had become normal at KTUL Radio, soon to become KELi. Comments: I want to echo Erick's comments. get out and vote, folks...it's just going on 3pm now, and there's about 4 hours left. It will take you all of about 30 seconds, so go out and do it!!! The loss of Warren Zevon to lung cancer should be a sobering reminder of what can be accomplished by long-term smoking. It's sad to see such a talented person die of such ridiculous circumstances. He'll be missed. Also, today is election day in Tulsa county. The much-debated Vision 2025 proposal is on the ballot. If you are a Tulsa county resident, please get out and vote, no matter where you stand on the issue. Let your voice be heard. If you don't vote, and the results don't go the way you want, you have no right to complain! Seems like I remember him being on the air when the tornado cut through Tulsa in the early 1970's - my parents had built a home south of 101st & Memorial (waaaaaay out there in those days! ), and I had climbed up on the roof and was watching the storm until my mom came out, found me, and ordered me down. :( ...I went in and listened to the KRMG, and I really seem to remember hearing Johnny Martin - can anyone verify this? Oh - I also remember when 71st & Memorial was a two-lane highway in the country. The only thing out there that I can remember there was a two-story diner/gas station on the west side of the road just north of the intersection - it was green, as I recall. Comments: I think it was Roy Pickett that told me a story about how some apartment people digging for a pool at KTUL's old site found a giant pyramid under the ground. It made news until they figured out it was the base for the very little used KTUL-FM tower. Trying to remember more of what he told me about that short-lived venture. Comments: Speaking of broadcasting from the transmitter the KRMG overnight show originated from Mannford and not from the downtown studios. Remember listening to the great Johnny Martin, Tulsa's Midnight King, as he used to hand it off at 1AM to Bob Lafitte for Laffitte's Inn. Check out the Johnny Martin page on this site. Comments: Frank, we need someone to fill in the gap. I worked at the Turley location in 1959. Gregory and Chew were already there. I would guess the move was made prior to 1958. When did the move to the transmitter site occur? Comments: In response to Frank, I checked with Gary Chew and we are both under the impression the move from Boulder on the Park to 56th Street North and Lewis was made for economic reasons. The studio was moved to the transmitter site in Turley which had been the Chief Engineers home. Gary pointed out that early on, Jack Morris did occasional newscasts on KTUL Radio via a telephone line from Lookout Mountain, so I wonder if there had been plans to consolidate both operations there. And the sales office never really moved from Boulder on the Park, but was housed on Utica Avenue near St. Johns Hospital. Another point Gary mentioned: KTUL Radio (1430) went directional at night and had to have an engineer on duty, perhaps additional evidence of a cost-cutting move. Comments: Mary Maestri's is not bad on the prices and doesn't expect formal attire, as many touristy types (such as myself) like to eat there. Last time I was there, it was still in the house. Nice Biography on cable about Tulsan Jennifer Jones this week. We have so many famous folks from the area. Yesterday, I drove by to see Mickey Mantle's old house in Commerce, which is right next to Steve Owen's hometown, Miami. I noticed they are building a Mickey Mantle museum. Comments: Anyone remember a man named Grady Styers? I found out from my father-in-law that his brother Grady worked for KAKC way back when at the transmitter site. Grady is gone now but I was wondering if any of the old KAKC crew knew and/or remembered Grady. Comments: When and why did KTUL move from Boulder-on-the-Park to Turley? I can't tell you about anything in Fort Smith; that's another world away from here in Fayetteville. If Mike M. lands in Fort Smith, take the 45-minute drive up I-540 and you'll also find an AQ Chicken House in Fayetteville. You don't need to go to Springdale. Also in Fayetteville, check places such as Jose's and Ozark Brewing Co. on Dickson Street and Uncle Gaylord's near the square. Fayetteville's newest sensation is Ella's restaurant inside the Inn at Carnall Hall, a century-old building on the U. of Ark. campus that was once a women's dorm, which was just remodeled into an upscale hotel. In Tontitown, Mary Maestri's has great Italian if you want a formal white tablecloth atmosphere. A half mile away is the Venetian Inn for old-style red-checked tablecloths and nothing formal. Gephardt had been up continuously since 4am today our feed was 9pm-9:40pm. He had to go back to his Hill office after his broadcast. Comments: The on-air break-up, engineered by radio/TV cohorts, was the most recent subject. Leon Russell's role in Gary Lewis' career was discussed. Tulsa locales for "The Outsiders" were named. Marlyn Johnson, a charter Romper Room teacher in the Winston-Salem area, contributed material that became a new Romper Room in Tulsa page. Brewster's Toys were remembered, and there was some OKC TV talk. Mazeppa dropped in to say that he liked Lowell's new CD (see the Bulletin Board). It's all in Guestbook 145.